In front of me is an empty page. 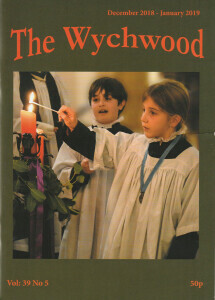 I have only around 200 words with which to sum up the contents of this issue of the Wychwood Magazine; how to start when we have such a plethora of interest? If variety really is the spice of life then we really have got what the bible calls, ‘life in all its fullness.’ I am completely in awe of our contributors who can contrive such variety. Each and every article will have its admirers; Martin Hallam gives us a whimsical view of events in his life as a parole officer, John Miskin reveals the truth behind the weather of 2018 and Richard Smith tells a warm-hearted tale of a police incident one Christmas in Blackbird Leys. You can read Jan Harvey’s account of a Christmas with a twist and, of course, at this time of year you can satisfy yourself with recipes for Christmas biscuits and mince pies, the latter with a distinct difference. In summary, I would like to thank all the contributors who have made this year’s issues so enjoyable, not to mention our amazing editorial team with their back-up committee. Without these individuals, the Wychwood Magazine would not be the publication that it is. And to all our readers, I wish you a joyful Christmas.